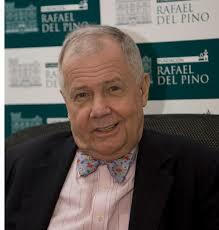 Jim Rogers is an American investor, author and businessman. He was born in 1942 in Baltimore, Maryland as James Beeland, Rogers, Jr.
71 year old Rogers had always been a multi-tasker. The Chairman of Rogers Holdings and Beeland Interests and co-founder of Quantum Fund famously retired at the age of 37 so he could travel the world. But, he continued to manage his own portfolio and became a professor of finance at Columbia University School of Business. He also presents television shows dedicated to subjects related to finance. Jim Rogers holds a degree from Yale University and he has also served in the US Army for a short period of time before he got a job at Wall Street. But, he actually started working at the age of five. At that time he used to sell peanuts and pick up empty bottles left behind by fans at baseball games. After six years of working at Wall Street, he joined Arnhold & S. Bleichroder, which is a consulting and investment firm. It was here he met George Soros with whom he co-founded Quantum Fund. Aside from being a successful investor, Jim Rogers is a doting dad too. He has two daughters with wife Paige Parker. In 2007, he sold his New York mansion and moved to Singapore believing that it was the perfect time for investment in the Asian markets. According to Rogers, the people of China are driven and motivated and he wanted to live in the same type of environment. For this reason, he wanted his elder daughter to be tutored in Mandarin as to prepare her for the future. He chose not to live in a Chinese city such as Shanghai or Hong Kong because of high levels of pollution. He chose Singapore instead. One of his most important works is the Rogers International Commodity Index which he founded in 1998. Rogers had always been keen about motorcycling and in 1990 he begun a world tour and travelled more than 100,000 miles across six continents. This performance allowed him to get his name in the Guinness World Record. Between 1999 and 2002, he set another record by travelling through 116 countries in a custom-made Mercedes. He covered a distance of more than 245,000 kilometers with his wife. Details of his journey, along with the route covered can be found on his official website. Following this journey, he wrote “Adventure Capitalist” which is his bestselling book. In fact, he has authored several books. Rogers believes that buying commodities guarantees success for investors. In an interview, he stated that if you want to make money, you should invest in commodities. Today, Rogers is among the very few investors with an investment record that proves his expertise. Roger’s published work contains some brilliant and inspiring quotes.